Jacinda, a teenage draki, is considered special among her pride. Like other draki, she’s descended from dragons and able to take on human form to disguise herself among mankind. What sets her apart, though, is that she’s the first fire-breather born in over 400 years. Eager to breed more fire-breathers, the pride's leaders propose to have Jacinda married off at 16. This kind of medieval thinking does not sit well with Jacinda's mother at all. Desperate to save her daughter from life as a brood mare, she uproots their family from the lush mountain wilderness to the stifling desert landscape of urban Las Vegas. Moving away from the wilderness will eventually cause the family’s draki spirits to wither and perish, leaving them trapped as helpless mortals. This is a fate that terrifies Jacinda, but it’s something that her mother is willing to let happen if it gives her daughter a chance at “normal” teenage life. Then Jacinda meets and falls in love with Will, a handsome boy from her new high school whose physical proximity gives off enough nourishing power for her draki spirit to thrive. The problem with this, though, is that while Will is sweet and caring, he also comes from a family of vicious hunters, who make their living off harvesting the draki for their meat and bones. As she struggles to embrace her cumbersome new life, can Jacinda make things work out? 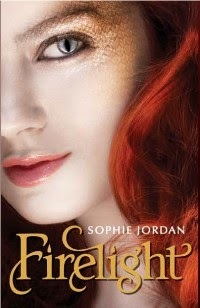 Sophie Jordan's Firelight takes the common dilemma of teen identity and self-discovery, interweaves it with fairy tale elements, and sets it against a high school backdrop. A strong protagonist, well-developed love interest, and realistic antagonists make this a very satisfying romance novel. Recommended for fans of Twilight and other supernatural YA romance, Ages 16-18.